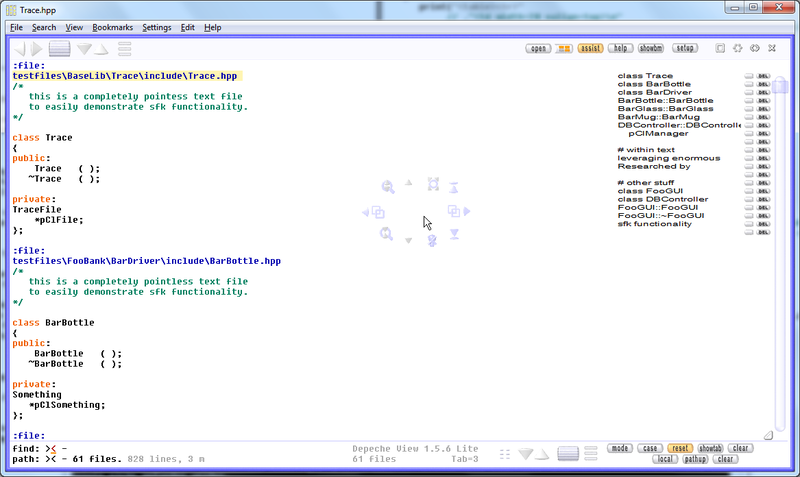 The list of all functions available through the Depeche View GUI. SHIFT    Key + Mouse Button selects for SEARCH. CONTROL  Key + Mouse Button selects for COPY. ALT      Key + Mouse Button selects for BOOKMARKING. LEFT MOUSE BUTTON    operates in the CURRENT View (Window). RIGHT MOUSE BUTTON   sends something into the NEARBY View. or if there is none, the leftmost. MIDDLE MOUSE BUTTON  sends something into the LEFT SIDE View. If there is none, it sends to the rightmost. -  a filtered view line selection. F5             lclick on reload     Pro: reload changed files. Pro: in edit mode: revert and end edit. F5+CTRL                             Pro: reload current file. *  F8                                  search for "class ..."
CTRL+E                              Pro: edit file in external editor. Pro: in edit mode: save and end edit. if search and replace have same length. CTRL+U         lclick on pathup     one step up in "path:"
Pro: in edit mode: save text changes. CTRL+D                              toggle filter view details. Pro: editor: delete whole line. CTRL+Y         CTRL+SHIFT+Z         jump forward in text location history. CTRL+Z                              jump back to a recent text location. Pro: editor: undo recent edit(s). Pro: editor: duplicate current line. CTRL+V                              copy clipboard to "find:"
Insert               reset the find or path mask. click on "find: " also clears the find mask. SHIFT+Backspace      reset the find or path mask. CTRL+Insert          same as CTRL+C, copy screen text to clipboard. in a filtered view, copies only visible lines. Pro: in edit mode: copy selection to clipboard. CTRL+SHIFT+Insert    same as CTRL+SHIFT+C, copy current text to clip. in a filtered view, copies all filtered lines. CTRL+Shift+Delete    Pro: in edit mode: delete to end of line. CTRL+Delete          Pro: in edit mode: move block to editor in nearby view. see also CTRL+right button below (cross copy). SHIFT+ENTER          editor: insert blank line. adding SHIFT is required for a global highlight. adding SHIFT is required to reset highlights everywhere. until the control key is released. move mouse while button down to select view. SHIFT+ click on a bookmark       -  goto bookmark and set path to that file. (1) after start of selection, click on another word within the same line. in case of copy to clipboard, words in other lines work as well. finally, release the keyboard key (SHIFT, CTRL or ALT). CTRL+left click into find mask   -  copy find mask content to clipboard. CTRL+left click into path mask   -  copy path mask content to clipboard. CTRL+SHIFT+lclick into top line  -  copy current filename  to clipboard. e.g. the "rfocus" button is visible once there are search results.